Here are a couple of different solar powered toys. 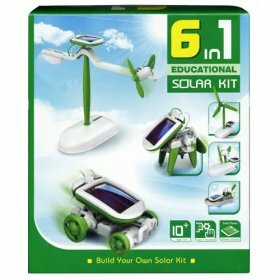 This solar powered construction kit can be assembled and reassembled in six different designs, including an airboat, a windmill, a puppy and two types of plane. Once the central motor has been constructed the six alternative designs can be built around it. The thing that makes this toy stand out from the crowd is the fact that it is powered by light from the sun via a small solar panel so not only is it better for the environment than the average kids toy, it’s a great way to slip a little ecological education under the radar. At just £13.95 this great educational toy is cheap enough to have as a stocking filler but fun enough to give as a main present. Delivery is £3.95 for delivery within 5 days or £5.95 for next day delivery. To buy this toy or to see more images or a video of it in action, click here to buy from the Ethical Superstore’s website. New from the ethical superstore, why not get the kids this great transforming, electronic robot for an eco-friendly stocking filler this Christmas? At £12.95 it won’t break the bank, and being solar powered, there aren’t even any batteries to buy! This little gem really is great value, being as it is really 3 toys in one. It can be a robot, scorpion or tank. It comes with easy to follow instructions on how to construct each toy and no glue is required. The robot walks, the scorpion crawls and the tank rolls. The robot/tank/scorpion is powered by a small solar panel which can be charged either with sunlight or with a 50w+ halogen bulb. This toy is powered by the clean, free energy from the sun, but the real ecological advantage is in the way that it will help educate your little ones about the need to reduce carbon emissions and the ways this can be achieved in a fun way. To order this toy for just £12.95, or to see more images or a video of it in action, click here to buy from the Ethical Superstore’s website. 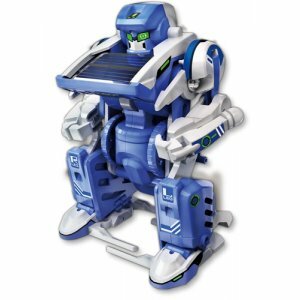 I really liked this article esp that I didn’t know you can buy solar powered toys like this and the price I found to be exceptional! and a 6 in 1 package, well what can I say, this will sure to keep my 3 kids busy as they will gain knowledge on how to build as well as reading and following documentation. « Energy Monitors – Will I Save Money?